Wanna buy some used Karhus? For the first time since fall, I've had two consecutive runs wearing short sleeves and shorts. Yesterday's temperature was moderate, but the humidity was anything but. Happily, today was cooler and far less humid. In both cases I was comfortable, helped along by overcast skies. I'm not looking forward to running in the summer heat and I hope I'll have the discipline to get out at dawn most of the time. Today's run or Rorschach test? Now that we are transitioning to warmer weather, I've started to pay attention to my lighter gear. 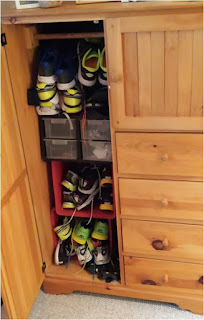 Over the past eight years, I've collected a lot of running clothes that I keep in a wooden wardrobe in the guest room. I have at least three pairs of running tights, three pairs of track pants and a sizable collection of quarter zips, rain jackets and long sleeve running shirts. My collection of short sleeve running shirts includes the first one I ever bought and every one after that. I also have a bunch of shirts I got from racing. Storage has extended to a dresser in my bedroom. I also have six pairs of running shorts and dozens of socks. Don't get me started on shoes. There are pairs I use and those I just can't throw out. I swear I'm not a hoarder, but I find it hard to throw out perfectly good running clothes. Perfectly good may mean different things to different people. I don't think rips and tears necessitate disposal. As long as you can wear it, and it doesn't expose areas that need to be covered in public, I think a shirt should be kept in inventory. In truth, I tend to wear the same gear, cycling through four or five pairs of shorts, the same number of shirts and about half a dozen pairs of socks. That changes a little when the seasons change and I put wool socks to the back of the drawer until fall. I know I should go through all this stuff and keep only those clothes and shoes that I actually use. I really should donate the undamaged shirts and recycle the old trainers. I'll make it a project for next weekend unless I can find anything else to do. You don't have to throw them away! United War Beterans or Big Brothers Big Sisters would be happy to take them off your hands (unless they're full of holes). Yes, absolutely. We donate to BB/BS frequently and I have put in running stuff that I had no personal attachment to. I know there are organizations like Soles4Souls that refurbish running shoes for disadvantaged people in the US and in Africa. I'm going to do it. I can't tell if you're being rude or supportive.